Judge Kavanaugh sought to undermine access to health care. Access to health care is a civil and human rights issue of profound importance. Based on his known record and the process by which he was selected, if confirmed to the Supreme Court, there’s every reason to believe that Judge Kavanaugh would vote to overturn and gut critical health care protections. 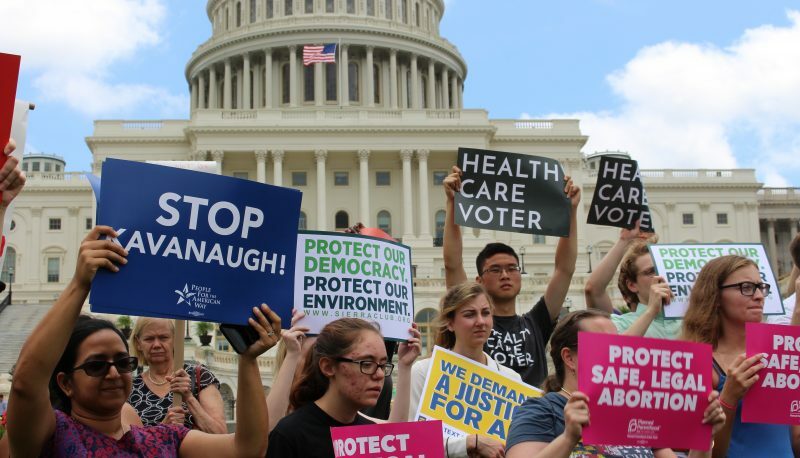 See Kavanaugh dissents in Seven-Sky v. Holder, Priests for Life v. U.S. Department of Health and Human Services, and Sissel v. U.S. Department of Health and Human Services. Judge Kavanaugh is hostile to reproductive freedom. Judge Kavanaugh has demonstrated his hostility to reproductive freedom both on and off the bench. He most certainly passed President Trump’s Roe v. Wade litmus test. See Kavanaugh ruling in Garza v. Hargan, his 2017 speech to the conservative American Enterprise Institute, and a recent op-ed from former law clerk Sarah Pitlyk. Judge Kavanaugh has restricted voting rights. In two voting rights cases, Judge Kavanaugh has demonstrated his lack of commitment to racial justice. See Kavanaugh ruling in South Carolina v. United States, Kavanaugh-Bork-Clegg amicus brief in Rice v. Cayetano, and his op-ed and interview on Cayetano. Judge Kavanaugh is dismissive of discrimination claims. Judge Kavanaugh’s ideological bias can also be seen in employment discrimination cases where he has dissented and voted to dismiss claims that a majority of his D.C. Circuit colleagues found to be meritorious. See Kavanaugh dissents in Howard v. Office of the Chief Administrative Officer of the U.S. House of Representatives, Miller v. Clinton, and Rattigan v. Holder. Judge Kavanaugh is hostile to workers’ rights. Judge Kavanaugh also has a pattern of ruling against workers and employees in other types of workplace cases, including workplace safety, worker privacy, and union disputes. See Kavanaugh dissents in SeaWorld of Fla., LLC v. Perez, National Labor Relations Board v. CNN America, Inc., and National Federation of Federal Employees v. Vilsack, as well as Kavanaugh ruling in American Federation of Government Employees, AFL-CIO v. Gates. Judge Kavanaugh holds anti-immigrant views. See Kavanaugh dissents in AgriProcessor v. National Labor Relations Board and Fogo de Chao Inc. v. Department of Homeland Security. Judge Kavanaugh holds troubling views on presidential power. Indeed, Judge Kavanaugh has expressed extreme and disturbing views about presidential power. See Kavanaugh in Minnesota Law Review, Georgetown Law Journal, and 1998 panel discussion. See also Kavanaugh ruling in PHH Corp. v. Consumer Financial Protection Bureau and Kavanaugh’s role in the Bush administration’s deeply flawed detention and interrogation policies. Judge Kavanaugh has undermined environmental protections. During his 12 years on the bench, Judge Kavanaugh has consistently ruled to protect polluters rather than the environment. He has opposed critical environmental protections for clean air and clean water, repeatedly ruling that the Environmental Protection Agency (“EPA”) exceeded its statutory authority in issuing rules to limit pollutants. See Kavanaugh rulings in EME Homer City Generation, L.P. v. EPA and Mexichem Fluor Inc. v. EPA, as well as Kavanaugh dissent in Howmet Corp. v. EPA. Moreover, Judge Kavanaugh has advanced an anti-environment view of the Chevrondoctrine. For more than three decades, Supreme Court precedent has required judges to defer to administrative agencies’ interpretations of federal law in most cases where the law is “ambiguous” and the agency’s position is “reasonable.” Judge Kavanaugh’s clear intent to overturn this precedent and its progeny would impede the ability of federal agencies like the EPA to carry out their vital missions. See Kavanaugh in Notre Dame Law Review and Harvard Law Review. Judge Kavanaugh opposes commonsense gun safety laws. Judge Kavanaugh clearly passes this litmus test. He dissented in Heller v. District of Columbia before it got to the Supreme Court and would have held that the D.C. ban on assault weapons was unconstitutional. Judge Kavanaugh has a pro-government bias in criminal cases. Judge Kavanaugh reflexively rules for the government in criminal cases. Out of his twelve dissents in criminal and law enforcement cases, Judge Kavanaugh ruled for the government in 10 of those cases, including United States v. Askew andRoth v. U.S. Department of Justice. Judge Kavanaugh holds troubling views on money in politics. Judge Kavanaugh’s judicial record indicates he would vote with the conservative bloc on the Supreme Court to continue opening the floodgates of money into our political system. If confirmed, Judge Kavanaugh would certainly be more aggressive than Justice Kennedy in lifting restrictions on big money, including EMILY’s List v. Federal Election Commission and Independence Institute v. Federal Election Commission. Judge Kavanaugh sought to undermine Church-State separation in education. As an attorney in private practice, Judge Kavanaugh was part of the legal team representing former Florida Governor Jeb Bush’s effort to create the Opportunity Scholarships Program. Notably, participating voucher students attending private schools would not have had the same civil rights, including their right to services as a child with a disability, as public school students. In 2006, the Florida Supreme Court struck down the program. See also GOP Congress amicus brief, authored by Kavanaugh, in Santa Fe Independent School District v. Doe. Judge Kavanaugh held many ideological jobs and affiliations prior to becoming a judge. Judge Kavanaugh’s right-wing ideology is reflected not only in his judicial record but also in his earlier career as a partisan lawyer. Kavanaugh was then rewarded with plum White House positions: from 2001 to 2003 serving as associate counsel and from 2003 to 2006 serving as assistant to the president and staff secretary. In these positions, he worked on the nominations of several contentious judicial nominees before he himself was nominated to the D.C. Circuit. He also worked on many policy issues. Kavanaugh is also a longtime member of the Federalist Society. Judge Kavanaugh has ties to Judge Alex Kozinski. With workplace harassment and sexual harassment holding national attention, senators must ask Judge Kavanaugh what he knew about Judge Alex Kozinski’s predatory and abusive behavior, when he learned of it, and what actions he took in response. He has reportedly remained a close associate and friend of Judge Kozinski since his 1991-1992 clerkship.